Dortmund face Mainz on the opening day of the 2016/17 Bundesliga season. The wait is finally over and the official Bundesliga schedule has been released for the 2016/17 season, and you can download your own copy right here. Download:Download the official Bundesliga schedule for 2016/17. The schedule was published at 11:00CEST/09:00GMT on Wednesday and pitted defending champions FC Bayern München up against SV Werder Bremen in the season-opener and will provide Bayern's new coach, Carlo Ancelotti, with his first taste of league action. 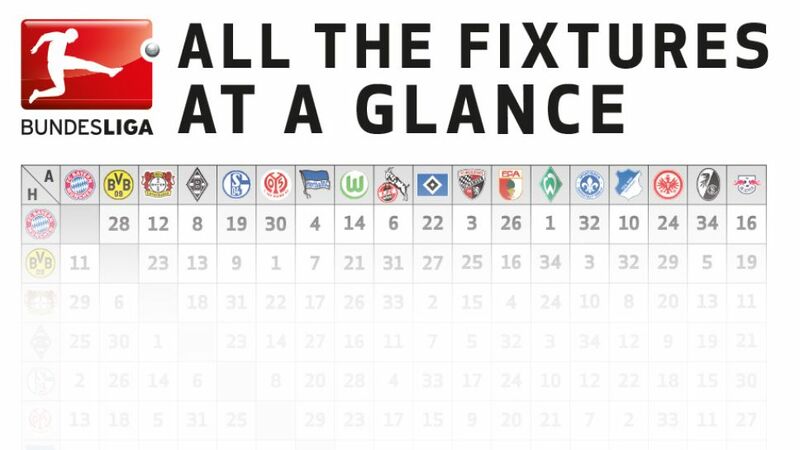 Below you can see all the fixtures at a glance, but why not click the download above and print off your very own wallchart of the Bundesliga schedule for the coming season. Stick it on your fridge, bedroom wall or office door to make sure you always know who is playing whom.